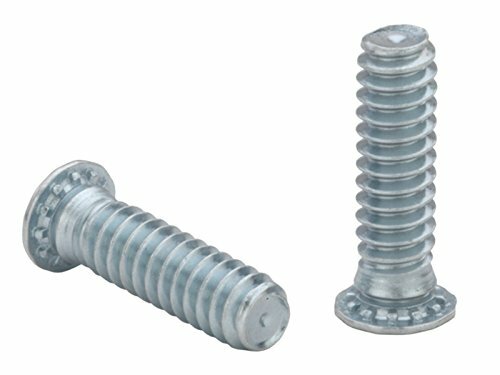 PEM® self-clinching studs are installed by placing them in properly sized holes in the sheets and squeezing into place with any standard press. The squeezing action embeds the head of the stud into the sheet. The metal displaced by the head flows smoothly and evenly around the ribs and into the annular groove - creating a flushhead assembly and securely locking the stud into the sheet with high torque-out and pushout resistances. FH (flush-head) studs are available in aluminum, steel, or stainless steel. They are also available unthreaded on special order. - Flush-head for sheet thickness of .040" and greater. - Type FH is recommended for use in steel or aluminum sheets HRB (Rockwell "B" scale) 80 or less and HB (Hardness Brinell) 150 or less. - Type FHS is recommended for use in steel or aluminum sheets HRB (Rockwell "B" scale) 70 or less and HB (Hardness Brinell) 125 or less. - Type FHA is recommended for use in aluminum sheets HRB (Rockwell "B" scale) 50 or less and HB (Hardness Brinell) 82 or less. View More In Self-Clinching Nuts. If you have any questions about this product by Pem, contact us by completing and submitting the form below. If you are looking for a specif part number, please include it with your message.